Moving Image Source is in the middle of posting Matt Zoller Seitz's remarkable five-part dissection of Wes Anderson and his influences, "The Substance of Style," and I'm reminded that you can always judge a good piece of film criticism by how much it makes you want to watch the movie (or in this case, movies) it's talking about. The ironic thing for me is that it also makes me a little wary of writing about the movie myself. Why should you listen to me when you can go watch Seitz's awesome video essay full of fantastic insights and groovy clips? Still, I have space to fill, and any excuse to rewatch a Wes Anderson film is a good one as far as I'm concerned. 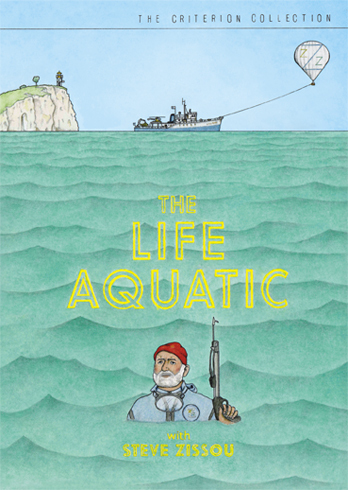 Having already covered Rushmore and The Royal Tenenbaums for this blog, The Life Aquatic with Steve Zissou seemed like the next logical choice. Those three films form the core of Anderson's output up until now, and they will likely be considered the main triumvirate of his early work, the essential Wes Anderson Mark I. His only feature-length since the 2004 release of The Life Aquatic has been The Darjeeling Limited , and that film serves as a summation of the films that preceded it and the beginning of Anderson's break from his own conventions. I wouldn't call Darjeeling the epilogue so much as the eulogy for all that has come before, and in relation, The Life Aquatic is the little red cap on this portion of Anderson's filmography. When at the very end of the picture, Bill Murray, playing Zissou, says, "This is an adventure," he is basically providing a coda for everyone previously introduced in the Wes Anderson world--the boys of Bottle Rocket, Max Fischer, and the Tenenbaum clan. That said, The Life Aquatic with Steve Zissou always seems to be the most maligned of these core films. Invariably, when talking about the movies with others, there is almost a knee-jerk need to claim that it is not as good as its siblings. It's a comment that is so predictable and automatic, it has become one I no longer trust, at least without some further qualification. More often than not, it's a movie that its detractors have seen once and never revisited, and whether they realize it or not, their main problem is an inability to forgive it for not being either Rushmore or The Royal Tenenbaums--which, of course, is absurd and also misses how amorphous the auteur really is. When you think about it, though one can draw a connector between those other films, that Rushmore is about the singular experience of the lone outcast and Tenenbaums is the collective experience of a family of outcasts (and one that Max Fischer might not have necessarily thrived in), they are also quite different. For as much as is made out of Anderson's signature style, the creator is not as singular as even his ardent fans make him out to be. Though his is a rarefied world, a kind of shared universe where any of these stories could exist side by side in terms of creating a larger whole, each movie is distinctly different. They may have variations on similar themes, the way that, say, Romeo & Juliet, Hamlet, and King Lear all mine relatable veins of love both romantic and familial, but they distinguish themselves as separate entities; in tone and setting, the Wes Anderson oeuvre is as vast as those three Shakespeare plays. The one theme that is common in all of Anderson's early films is that of strained relationships between fathers and sons (and sometimes daughters). In Rushmore, Max turns to Bill Murray's character as a surrogate dad, whereas Royal Tenenbaum is trying to reconnect with the children he has become estranged from. In Max's case, he has a solid father figure, but he's looking for a kind of pal in Herman Blume, and in turn Herman is using their friendship as a way to recapture his youth. This is, of course, analogous to Royal's biggest problem, he's been a much goofier goof-off than his offspring have ever been allowed to be. The only guy who has him beat for being an overgrown child is Steve Zissou. The Life Aquatic has another son in search of dad. Ned Plimpton (Owen Wilson) believes the famous oceanographer, Steve Zissou, to be his father. He's always suspected, but his mother's recent deathbed confession has prompted him to touch base with Zissou at long last. Though the adventurer accepts Ned, the young man has also come to him at the worst time. Now past 50, the films of his oceanic adventures are no longer in vogue, and his best friend (Seymour Cassel) may have been eaten by a creature that may or may not exist. Though the devouring is inarguable, there is some debate over what the attacker was. Zissou believes it to be a previously uncatalogued creature, a spotted Jaguar Shark. Where Anderson is flipping the script on the standard father-son relationship story is that Ned's seeking out of Steve Zissou ends up being less about Ned discovering who Ned really is and more about him making Zissou look at himself. The quest isn't to find the father, but to make Zissou into one. Steve resists, even saying it's "Because I hate fathers, and I never wanted to be one." To be a father is to accept responsibility, to let the adult world that Zissou has held at bay take hold. The Zissou crew, which their captain describes as a group of strays, is like the Little Rascals had they never grown up, split up the gang, and gotten real jobs. Or, in the Anderson parlance, the Peanuts gang now under the command of Snoopy and constantly chasing Red Barons. They are grown men in silly hats and matching outfits traveling the oceans and making up adventures for themselves. Ned, then, serves as a second chance. Not only does he come with a pile of money that he can sink into dad's latest film, but he also represents a possible legacy. Anderson is actually creating a multi-tiered look at family here. In addition to the older generation (Steve) and the younger one that has followed it (Ned), an even younger generation is represented in the child currently growing in the belly of the reporter tagging along for the ride. Jane Winslett-Richardson (Cate Blanchett) joins the mission to find the Jaguar Shark so she can write a portrait of Team Zissou for an oceanography magazine. Her unborn child is the product of an illicit affair with her editor, a married man, and her going out to sea is both a running away from that situation and an act of revenge. Not unlike Zissou's desire to find and kill the Jaguar Shark, Jane wants to write a hatchet piece on Steve. He has become a symbol of how men have failed her, the idealized image of the gentleman scientist that she saw in Zissou as a girl translating into the untrustworthy, live-for-the-moment kind of guy that has now abandoned her to the life of a single mom. The "official" picture of him pointing at an unseen horizon that Jane said she had on her wall as a young girl apparently was pointing her in the wrong direction; or maybe it was telling her to go away ("No Girls Allowed!" "He-Man Woman Hater's Club!"). Is it any surprise, then, that she gets in between Steve and Ned as an object of romantic interest? The abandoned child and the father who abandoned him locked in a war for the possession of the next kid down the line. Which one will he turn out to be? Jane utters an interesting Freudian slip in relation to this: "I need to find a baby for this father." When she says it, she's speaking to Zissou, and the man noticeably reacts. Like all Freudian slips, the mistake--here, switching the roles--is meant to serve as a message to what is really going on. Again, Steve Zissou needs to become the father he was always meant to be. This is not just in relation to Ned, but also in re-establishing his leadership. When crisis hits and pirates attack Team Zissou, Steve begins to reclaim his role as captain, even if it is going to have to get a little worse (a mini mutiny, injury and even death) before it gets better. His selfish ways have lead the gang toward ruin, and his vengeful tunnel vision is going to finish them off. In a weird way, for all the risks Zissou has apparently taken in his many filmic adventures, he's an expert at playing it safe. It's easier to act only for yourself and not let others hurt you. Consider that this is a man whose view of love involves one crab ripping off the arm of another. No wonder Eleanor has lost the will to keep trying--and little does he know how much she has helped foster the illusions of his arrested development, as noted in her secret confession to Jane. Once again, the battle comes down to a battle between youth and old age, between the fantasies of a child and the legacy of an accomplished man. Following tragedy, in a quiet moment of self-reflection, Jane notes that twelve years from now, her unborn child will be 11 1/2. "That was my favorite age," Steve wistfully replies, and it's the age he's been trying to keep from growing out of. Compare this with his response when he sees the Jaguar Shark again: "I wonder if it remembers me." This is real change. His development no longer arrested, Steve Zissou has stopped thinking about the transitory pleasures of childhood and started to think about the last impression of adulthood. Ironically, Zissou comes to this realization by rediscovering his youth. Or, at least, the wonder he saw in the world that made him want to be the man he is in the first place. The Jaguar Shark, the monster that snatched away his delusions, the object of his intended vengeance, turns out to be a beautiful creature that should be admired rather than destroyed. The goal of scientists and explorers alike is to see a world that is bigger than they are, to find what has previously been left undiscovered. The message has been there all along. Wes Anderson's decision to have the sea creatures Zissou repeatedly encounters animated by Henry Selick, the visionary director of The Nightmare Before Christmas and Coraline, was no mere whim, but an important part of the movie. It's meant to be disconnected, meant to be wondrous, and we're supposed to notice it far more than Zissou does. Anderson wants us to ask how he can fail to appreciate this. That's why little Werner** (Leonardo Giovannelli) gives him the seahorse at the beginning of the movie, to remind Zissou of the wonder he himself has inspired, and why it's then so fitting that one of the final shots of the movie is of Zissou carrying Werner on his shoulders, triumphantly returning to the fray as a creature as unique and inspirational as the Jaguar Shark and the many other wondrous things to be found in the life aquatic. It is here, then, that character and creator meld, where Steve Zissou stops being a vehicle of expression and becomes more a true avatar for Wes Anderson. Like him, the director will put away childish things and in doing so, has already begun his quest for more mature themes in his stories. Yet, he has done so without sacrificing any of that personal style that Seitz has spent so much time dissecting. He is still interested in finding the humor in the greatest tragedies and the anarchy that arises when one attempts to impose order. He is still interested in how people get along, and how personal perception distorts one's chosen environment. Anderson sees the world in his own way--with his own crazy eyes, as it were--and the promise inherent in the transformation of Steve Zissou is that the man will never stop peering at the world in this way. The true artist as well as the true adventurer can grow up, but he doesn't have to grow completely out of it, not as long as he's willing to keep looking for new passions and wonderment. * In this goal, Wes Anderson is aided by his brother Eric, the artist who provides the drawings for the movies and their DVD covers. Eric's child-like aesthetic not only looks as if it were drawn by a younger hand, but it also looks antiquated, like the memory album of an elementary school student circa the mid-20th century. Don't just preserve the moment, but preserve how one saw it at that age. This, of course, is used to the best effect int the wall of portraits in The Royal Tenenbaums. ** Is it possible that Werner is named for Werner Herzog, whose own cinematic mission, particularly in the recent documentaries made in the years since Anderson's movie, is to chronicle the wonders of this crazy world we live in? "Is it possible that Werner is named for Werner Herzog(...)?" Of course. It's no coincidence that Werner's uncle is named Klaus. No biggie. Great article, by the way. You really helped me realize things about the movie I felt when watchng it, but couldn't put my finger on. I love The Life Aquatic, but I guess most people couldn't see past the baroque production design and dismissed it right away. It's been great to see all this talk about Anderson popping up in film forums after the Seitz video essay. More than anything, I think it has provided an opportunity for a lot of people to reevaluate Anderson's body of work from a more objective position than their first impressions. I'm planning to cover Bottle Rocket next, a film I wasn't all that keen on the first time I saw it a couple of years ago. Maybe time has healed those wounds. "I wouldn't call Darjeeling the epilogue so much as the eulogy for all that has come before, and in relation, The Life Aquatic is the little red cap on this portion of Anderson's filmography. When at the very end of the picture, Bill Murray, playing Zissou, says, "This is an adventure," he is basically providing a coda for everyone previously introduced in the Wes Anderson world--the boys of Bottle Rocket, Max Fischer, and the Tenenbaum clan." I loved that especially. Great post. I was one of those that wrote THE LIFE AQUATIC off as a lesser film in Anderson's catalog without substantial evidence. I will certainly revisit this film with my eyes opened a little wider. Thanks. P.S. I think Esteban is Ned's father. I felt that the movie was best understood as a fantasy of 10 (?) year old Ned's, as he imagines himself growing up and then meeting his father. It contains so many of the crazy things that inhabit the dreams of a young boy, including the animated aquatic scenes, the cartoon violence, Ned's own tragic death ("...then he'll be sorry! "), and even the idea that his unknown father turns out to be his own boyhood hero. This is a very late comment (8 years late! ), though I want to let you know that I really appreciated this article! I have been thinking about what the meaning of this movie was for a long while, and I was disappointed to not see many interpretations discussed about it. It is one of my favorites movies. Thanks, G! Glad you found your way here.